"What do you want your doctors to know to help them help you? Edward C. Rosenow III, MD, J. Keith Mansel, MD, and Walter R. Wilson, MD, have a combined 100-plus years of experience in medicine and medical education. They are sharing that expertise with members of the medical community to help them better navigate the patient interaction and also offer them practical guidance as they move through their careers. The authors begin with advice about medical education for students who are planning a career in the health-care field. Readers will learn about the career process from residencies to fellowships to private practice or academic medicine. From the beginning of the book to the end, the focus always is on patients and remembering that every doctor should help their patients in the most professional manner possible—and always with empathy. Treat every patient like you would want a member of your family treated. In addition, the book includes a bonus chapter for patients, who will learn how to make the most of their time when they are with their health-care providers. 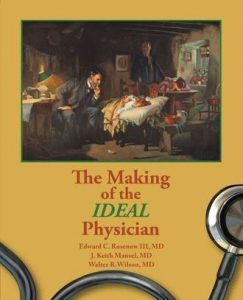 There is a miraculous moment when the very presence of the physician in the room is the most effective part of the treatment."